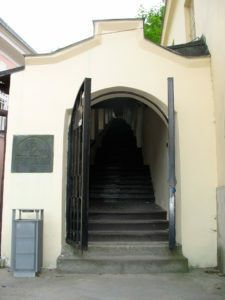 The renaissance parish stairway was built in 1568 as a defence passageway serving the members of the city art’s guilds to defend city walls ranging from the St. Michael’s Carner to Trenčín Castle. The stairway also served as an access road to the town armory, built in 1565 next to the carner. 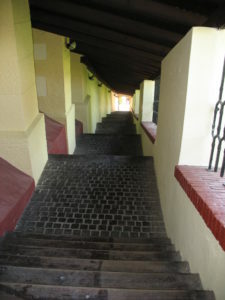 The stairway was damaged by fires in the years 1708, 1790 and 1886. After its restoration, the stairway was used as a public communication. It connected the center of the town with the area of Parish church, Trenčín Castle and later with the Brezina woods. 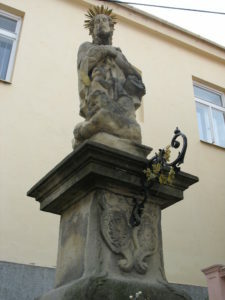 Before the starway, there is a stone statue of St. John Nepomuk who is kneeling on a cloud and is dressed in sacral garments. At his feet there is an angel on knees.